Data have been collected from multiple NJ stations over a long period of time, some dating back to the nineteenth century. With this amount of data, we can perform a multitude of analyses on different variables, such as daily maximum or minimum temperature. In this brief report, we examine seasonal maximum minimum temperature (that is, the highest daily minimum temperature in a meteorological season) and the seasonal minimum minimum temperature (the lowest daily minimum temperature in a meteorological season). Each of these values has potentially important ecological and human health impacts. For instance, an increase in the lowest minimum may permit the eggs of insects, such as the Southern Pine Beetle, to survive winters in regions where colder temperatures in the past prohibited survival (Ayres et al. 2011). This beetle has already invaded the New Jersey Pinelands, and threatens to do considerably more damage. In this study, we hypothesize that the reason for the invasion is at least in part a function of warmer extreme minimums. A summer increase in the maximum minimum may be indicative of greater heat stresses being placed on those individuals without means of artificial cooling at night. This affects their ability to recover from previous daytime heat and to be better able to handle subsequent heat. Here, we hypothesize that the warmer NJ summers over the early years of the 21st century are accompanied by a rise in the warmest minimum temperatures. 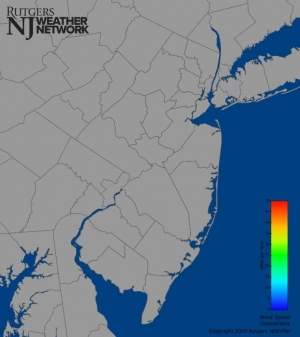 Study data are from six National Weather Service Cooperative Observing (COOP) stations distributed throughout New Jersey: namely, Charlotteburg Reservoir, Newark-Liberty International Airport, New Brunswick, Indian Mills, Seabrook Farms, and Cape May (Figure 1). Data were retrieved from the national archive via the NOAA Regional Climate Center’s Applied Climate Information System (ACIS). Figure 1. 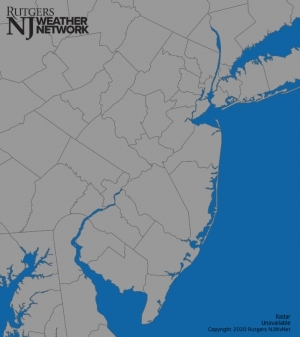 The six NJ COOP stations used in this study. Daily minimum temperatures are analyzed from March 1965 (the start of meteorological spring that year) to August 2017, just over a fifty-year time span. A Python program was written to extract extreme daily minimums (coldest and warmest values) for each month during the study period. Months with ten or more days missing were excluded from the study, and any seasons with at least one discarded month were not used. Seasonal time series were generated for extreme maximum minimums and minimum minimums for each station. Figures 2 and 3 are examples of time series for seasonal extreme maximum minimum and minimum minimum temperatures for the Indian Mills COOP station from 1965-2017. Figure 2. Summer maximum minimum temperatures from 1965–2017 at Indian Mills, NJ. Figure 3. Spring minimum minimum temperatures from 1965–2017 at Indian Mills, NJ. The slopes of the linear regressions were calculated for all stations and seasons, a total of forty-eight values, which are displayed in Table 1. The interested reader may find all of these plots available here. Each cell corresponds to a linear regression for the time range, expressed as the temperature change in degrees Fahrenheit per decade. Red cells indicate increases in temperature over the 1965–2017 period, while the single blue cell represents a decrease in temperature for that station/season. Cells are shaded based on the magnitude of the increase or decrease in temperature. Table 1. Slopes of the linear regressions (in °F/decade) for Cape May (CM), Charlotteburg Reservoir (CR), Indian Mills (IM), New Brunswick (NB), Newark-Liberty International Airport (NL), and Seabrook Farms (SF) from 1965–2017. The section on the left represents the overall seasonal trends in maximum minimum temperatures for these stations, and the section on the right represents the overall seasonal trends in minimum minimum temperature. Bolded values have a p-value of less than 0.05, indicating statistical significance at the 95th percentile. The clearest overall trend shows an average increase in minimum temperatures for these six stations, as seen by the overwhelming majority of red in the table. The magnitude of this warming of extremes exceeds that seen in seasonal mean minimum temperatures at all stations in all seasons except for spring extreme minimums (not shown here). This is just one aspect of these results that requires further diagnosis in our ongoing study. Winter seasons have experienced the largest increases in both maximum minimum and minimum minimum temperatures. Spring minimum minimum temperatures changed the least over the study period, which is consistent with the fact that all spring slopes are not statistically significant. Seabrook Farms has the overall greatest increase in extreme minimum temperatures, with Indian Mills second and Charlotteburg Reservoir third. Cape May extremes have changed the least, and there is even one seasonal decrease in minimum minimum temperatures. Inland stations show a greater increase in temperature than those closer to the coast. In particular, Cape May, on the peninsular tip of southern New Jersey, has shown the smallest increases. The linear regressions of mean minimum temperatures were calculated and the slopes compared to both the maximum minimum and minimum minimum slopes. These differences are provided in Table 2, which shows that the magnitude of the warming of extremes exceeds that seen in seasonal mean minimum temperatures at all stations in all seasons, except for spring extreme minimums. Table 2. Difference between the slopes of the linear regressions of extreme minimum and the mean minimum for these stations (in °F/decade) for Cape May (CM), Charlotteburg Reservoir (CR), Indian Mills (IM), New Brunswick (NB), Newark-Liberty International Airport (NL), and Seabrook Farms (SF), from 1965–2017. A red cell indicates that the seasonal extreme minimum (whether it be a maximum minimum or a minimum minimum) is increasing at a faster rate than the seasonal mean minimum temperature. A blue cell indicates that the seasonal extreme minimum is increasing at a slower rate than the seasonal mean minimum temperature. Overall, throughout New Jersey, extreme minimum temperatures are increasing at a faster rate than the mean temperature, except for spring minimum minimums. An analysis of extreme seasonal minimum minimum and maximum minimum temperatures at six stations across New Jersey show a strong warming pattern over the past 52 years. This is most pronounced in winter, especially at inland stations. In other seasons the increase is greater in maximum minimum temperatures. The overall warming of seasonal extreme minimums exceeds that of seasonal mean minimums, except in spring minimum minimum temperatures. Changes in these extremes play a role in human health and the potential survival of harmful invasive insects. Ayres, M. P., S.J. Martinson and N.A. Friedenberg. 2011. Southern pine beetle ecology: populations within stands. Pages 75-89 in R.N. Coulson and K.D. Klepzig, editors. Southern Pine Beetle II. Gen. Tech. Rep. SRS-140. USDA Forest Service, Southern Research Station, Asheville, NC.